We know you guys love a cheeky tipple—scotch, whisky, wine; it’s all good. But for anyone who knows they love a good drop of Japanese whisky but isn’t really sure why, this one’s for you. We sat down with Australia’s Japanese Whisky guru at Beam Suntory. More specifically, with their National Whisky Ambassador, Daniel Woolley, who literally took time out from his sunshine-filled holiday in Fiji to chat about his love of whisky. With production dating back to 1870, commercial distilling didn’t start until 1923 at the Suntory Yamazaki distillery just outside of Kyoto. Fast forward to 2018 and we’ll forgive you for thinking that Japanese Whisky is every-damn-where (and we aren’t complaining), so let’s just say we had plenty of questions for Daniel. Grab yourself a whisky, settle in and listen up team—it’s time to talk Japanese whisky. 1. First Up—What Makes Japanese Whisky Different From The Rest? There are a few differences when it comes to Japanese whisky, the most obvious being their meticulous attention to detail and utmost honour in everything they do. The rare Mizunara oak casks used during the ageing process also give Japanese whisky a very unique flavour profile—sandalwood incense on the nose with peach and nectarine fruits on the palate. TUL translates: it can be hard for the non-regular whisky drinker to differentiate between Japanese and other whiskies but typically, they are slightly lighter. 2. 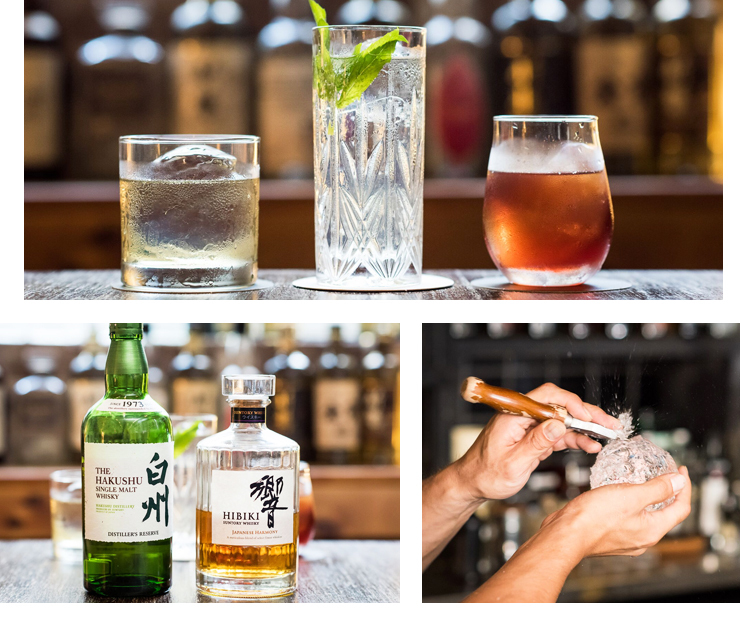 What Makes Japanese Whisky Most Similar To Scottish Whisky? Japanese whisky is based on Scottish whisky. By that, we mean the art of creating single malts of different flavours and blending them together is similar, either with or without grain whisky, depending on the type of whisky being created. There is a fantastic Japanese word—tsukuriwake—which translates to 'the diversity of whisky making'. This basically represents blending different flavours together to create a masterpiece, AKA exactly what makes Japanese Whisky so great. 3. What Is The Dfference Between Japanese Whiskies By Region? Japanese Whiskies do not have particular regions like their Scottish counterparts, but some distilleries and whisky expressions have particular production techniques and materials that give their whisky vastly differing flavours. There is even a Japanese Whisky being produced at the moment from rice grain instead of traditional barley. Different demographics and ages drink their whisky in a multitude of different ways in Japan. Some neat, some on the rocks or over hand carved ice, and some with water. But the big craze in Japan at the moment is the 'Highball' which sees a tall glass filled with ice, a serve of whisky, all topped with soda and a slice of lemon. 4. How Is Japanese Whisky Best Served? Daniel likes to drink different whiskies in different ways. He tells us that whisky isn't a drink where one size fits all. Kakubin is best in a flavoured highball, especially with ginger and yuzu. Hibiki is best on a large sphere, or hand carved ice. Where as Yamazaki and Hakushu Distillers Reserve whiskies are great neat, on the rocks or in classic cocktails or variations. Basically, they’re ridiculously versatile. When it comes to rare and super premium single malts, these are best served neat with water on the side so that you can add what you desire for your personal palate. Although (and most importantly) Daniel tells us that there is no wrong way to drink your whisky, if you have a smile on your face you're doing it right. TUL translates: Daniel is our kind of guy. 5. How Do You Spot A Good Bottle Of Japanese Whisky? Any Yamazaki, Hakushu or Hibiki whiskies are a solid choice. Rare and limited edition releases are also great investments, but he personally believes all whisky is made for drinking. TUL: Permission to drink up team! 6. Can You Recommend A Good Bottle For All Budgets? For an everyday drinking/mixing whisky you can't go wrong with Kakubin. Hakushu Distillers Reserve is amazing as a mid-range tipple for its balance of fruits, spices, sweetness and subtle touch of smoke. Dan’s favourite (we’re totally calling him Dan now) is the super-premium whisky released this year by Yamazaki Mizunara. Their 18-year-old 2017 release is a truly outstanding, once in a lifetime drop. His advice—If you ever get a chance to taste it, savour every sip. 8. What Makes Japanese Whisky So Great?